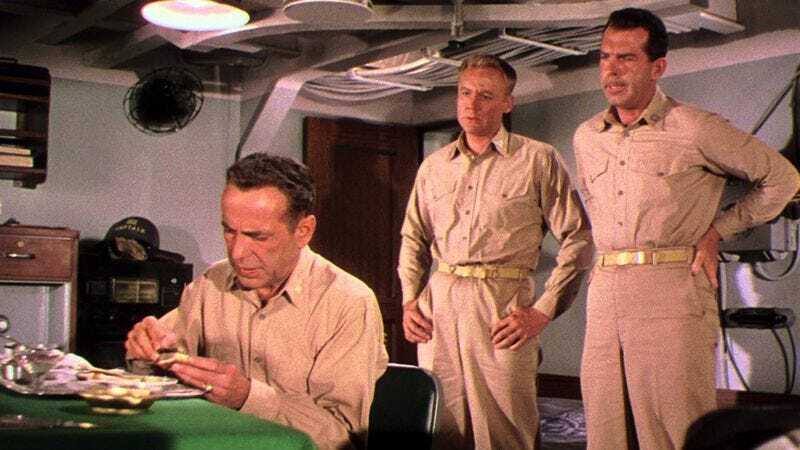 The 1954 film adaptation of Herman Wouk’s celebrated novel of the same name, The Caine Mutiny gets off to a mildly rough start before its purpose comes into full focus, but once it does it’s an engrossing, thought-provoking work. It occupies numerous checkpoints on the gradual transition from Hollywood classicism to modernity, a process embodied in the person of Humphrey Bogart, one of the great stars of the classical era, playing radically against type as a man unraveling, unsure, and unable to hold the center. The result is, surprisingly, not only unnerving but somewhat terrifying. A general sense of decay and instability pervades the film, set aboard an aging—if not completely obsolete—naval destroyer, the Caine. Its generally down-at-the-heels state disappoints the film’s point-of-view character, Ensign Willie Keith (Robert Francis), who is even more taken aback by the casual attitude of the crew toward discipline and military regulations. When the captain, a pragmatic career military man with no illusions, is replaced by the fastidious and highly decorated Philip Queeg (Bogart), Keith is—while distinctly in the minority—pleased and clearly anticipating a new day. However, almost immediately, Queeg’s obsession with seemingly irrelevant details and insistence that great forces are conspiring against him leads to a decay in ship morale and operational ability far in advance of anything that had come before, eventually leading to the very mutiny of the film’s title. While the opening passages of The Caine Mutiny are relatively slow and light on event, there is still a great deal to enjoy, primarily the splendid Technicolor cinematography by Franz Planer that establishes the Caine as a physically vivid entity of its own, an Earth of metal, grit, and sea salt, the stage on which the follies of man play out. Keith and fellow officers Maryk and Keefer (Van Johnson and Fred MacMurray, respectively) struggle between their duty and innate sense of justice in various ways, but there is a deep and primally naval way in which their ultimate duty is to the ship itself, on a level equal to love of God and country. Thus, Bogart’s decompensation, leading to a climactic courtroom duel with naval lawyer Jose Ferrer (in an absolutely exquisite performance), is an affront to the natural order. The fact that it’s Humphrey Bogart losing it—twitching, compulsively clacking two ball bearings together in his hand, erratically and impotently insisting on his absolute power—is just as aberrant. It’s a powerful piece of work by Bogart, playing against his own star persona, which he had done before, but also against the very idea of movie stars or even of constancy at all. Availability: The Caine Mutiny is available on DVD from Netflix or your local video store or library, as well as through the usual digital outlets.